62445301681 ;jsessionid=10179h1fmoetmgv45128i1q565oot8.10179?wicket:interface=:0:beta-club:modal-container:modal-content:content:body:login-rixty-form:visibilityContainer:fbconnect::IActivePageBehaviorListener:1:2&wicket:ignoreIfNotActive=true It seems like your browser is preventing Facebook Authentication. This happens when your browser's Tracking Protection is enabled. To continue logging in via Facebook, please turn off Tracking Protection or use a different browser. 62445301681 ;jsessionid=10179h1fmoetmgv45128i1q565oot8.10179?wicket:interface=:0:login-panel-small:login-small:login:modal-container:modal-content:content:body:login-rixty-form:visibilityContainer:fbconnect::IActivePageBehaviorListener:1:2&wicket:ignoreIfNotActive=true It seems like your browser is preventing Facebook Authentication. This happens when your browser's Tracking Protection is enabled. To continue logging in via Facebook, please turn off Tracking Protection or use a different browser. 62445301681 ;jsessionid=10179h1fmoetmgv45128i1q565oot8.10179?wicket:interface=:0:login-panel-small:login-small:signup:modal-container:modal-content:content:signup-form:fbconnect::IActivePageBehaviorListener:1:2&wicket:ignoreIfNotActive=true It seems like your browser is preventing Facebook Authentication. This happens when your browser's Tracking Protection is enabled. To continue logging in via Facebook, please turn off Tracking Protection or use a different browser. 62445301681 ;jsessionid=10179h1fmoetmgv45128i1q565oot8.10179?wicket:interface=:0:redeemcode:modal-container:modal-content:content:body:login-rixty-form:visibilityContainer:fbconnect::IActivePageBehaviorListener:1:2&wicket:ignoreIfNotActive=true It seems like your browser is preventing Facebook Authentication. This happens when your browser's Tracking Protection is enabled. To continue logging in via Facebook, please turn off Tracking Protection or use a different browser. 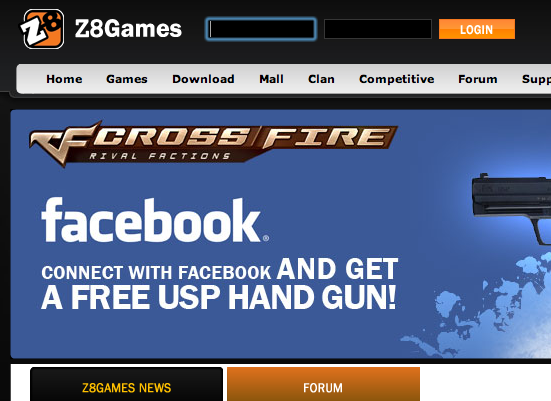 - These codes are Rixty credits to be used exclusively in the CrossFire store. 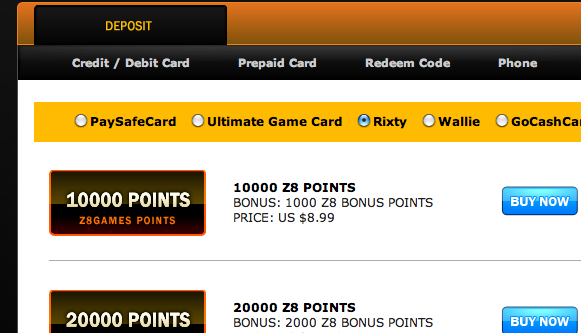 These codes are Rixty credits to be used exclusively at CrossFire. 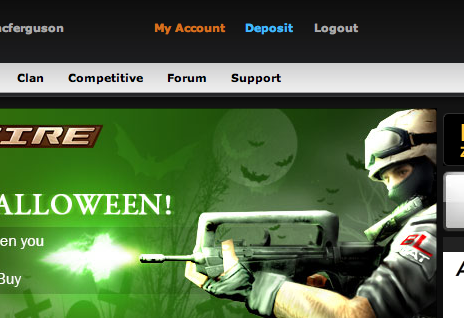 If you already have credits in your Rixty account, buy ZP directly at the CrossFire website. 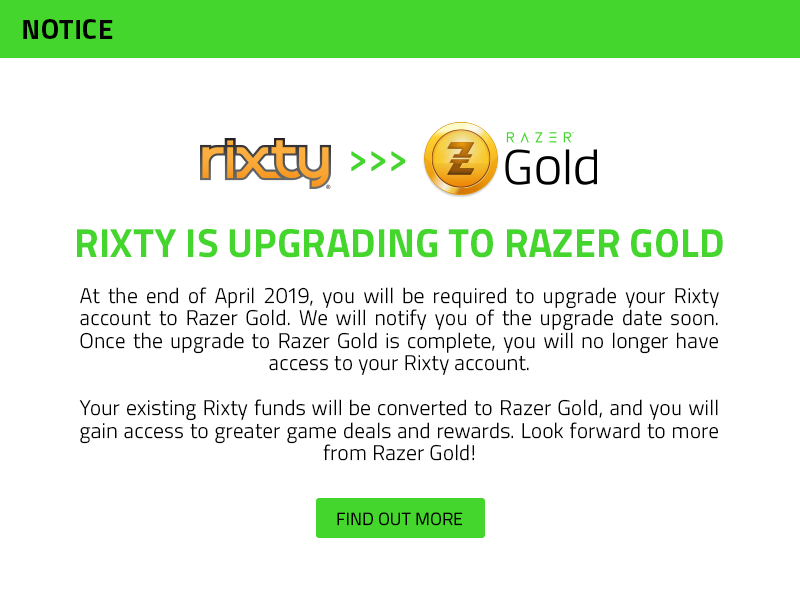 No refunds will be given for attempts to use these codes elsewhere. 62445301681 ;jsessionid=10179h1fmoetmgv45128i1q565oot8.10179?wicket:interface=:0:microsite:microsite-inner:epins-wrap:epin:0:checkout-form:price-btn:modal-container:modal-content:content:body:login-rixty-form:visibilityContainer:fbconnect::IActivePageBehaviorListener:1:2&wicket:ignoreIfNotActive=true It seems like your browser is preventing Facebook Authentication. This happens when your browser's Tracking Protection is enabled. To continue logging in via Facebook, please turn off Tracking Protection or use a different browser. 62445301681 ;jsessionid=10179h1fmoetmgv45128i1q565oot8.10179?wicket:interface=:0:microsite:microsite-inner:epins-wrap:epin:1:checkout-form:price-btn:modal-container:modal-content:content:body:login-rixty-form:visibilityContainer:fbconnect::IActivePageBehaviorListener:1:2&wicket:ignoreIfNotActive=true It seems like your browser is preventing Facebook Authentication. This happens when your browser's Tracking Protection is enabled. To continue logging in via Facebook, please turn off Tracking Protection or use a different browser. 62445301681 ;jsessionid=10179h1fmoetmgv45128i1q565oot8.10179?wicket:interface=:0:microsite:microsite-inner:epins-wrap:epin:2:checkout-form:price-btn:modal-container:modal-content:content:body:login-rixty-form:visibilityContainer:fbconnect::IActivePageBehaviorListener:1:2&wicket:ignoreIfNotActive=true It seems like your browser is preventing Facebook Authentication. This happens when your browser's Tracking Protection is enabled. To continue logging in via Facebook, please turn off Tracking Protection or use a different browser. 62445301681 ;jsessionid=10179h1fmoetmgv45128i1q565oot8.10179?wicket:interface=:0:microsite:microsite-inner:epins-wrap:epin:3:checkout-form:price-btn:modal-container:modal-content:content:body:login-rixty-form:visibilityContainer:fbconnect::IActivePageBehaviorListener:1:2&wicket:ignoreIfNotActive=true It seems like your browser is preventing Facebook Authentication. This happens when your browser's Tracking Protection is enabled. To continue logging in via Facebook, please turn off Tracking Protection or use a different browser. CrossFire is a free-to-play first person shooter (FPS) game with powerful and strategic action as well as unique strategic battle maps. 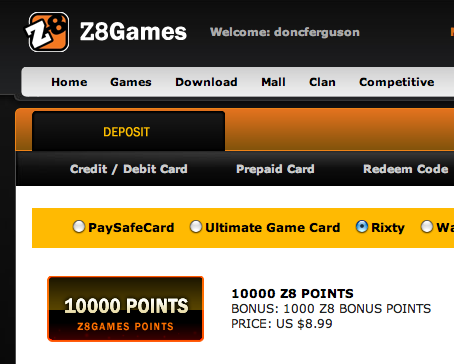 Login to your Z8 Games Account. Select "Deposit" from the top menu. 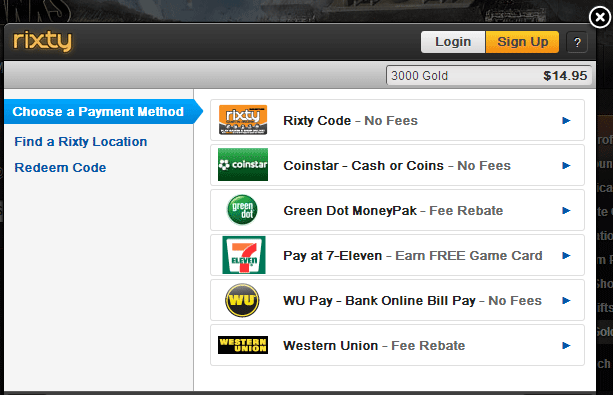 Select "Prepaid Card" under DEPOSIT, then select the Rixty payment option. Choose the number of Z8 Points to purchase, and press the "BUY NOW" button.